Archdeacon Vasyl originally comes from Wilkes-Barre, PA. He was formerly a Roman Catholic, and a member of the Franciscan Order. His family background is Polish on his father’s side and Ukrainian on his mother’s side. While studying for the priesthood in Boston, he left the Franciscans and converted to the Orthodox Church. He still felt the calling to the monastic life and was tonsured by his former bishop, of eternal memory. Through the prayerful influence of his maternal grandmother, he joined the UOC-USA and was tonsured a reader and sub-deacon by His Eminence, Archbishop (now Metropolitan) Antony. In January 2006 he was ordained as a hierodeacon (monk-deacon) by His Eminence at St. Andrew UOC, in Boston. He retired from his secular job in Boston in the Summer of 2014 and moved to Woonsocket. He was elevated to the rank of Archdeacon by Metropolitan Antony on November 20, 2016. 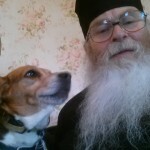 Archdeacon Vasyl is a dog-lover and is presently “owned” by his beagles, Mooney and Joey.